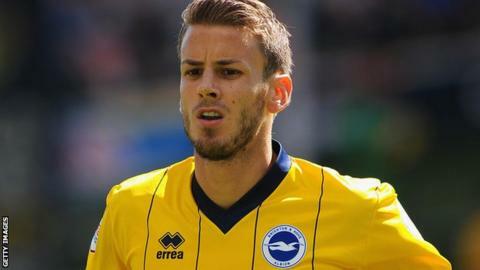 Brighton midfielder Andrea Orlandi says it will take time for him to return to full fitness after three months out. Orlandi made his return as a substitute in Saturday's 1-1 draw with Bournemouth following a knee injury. The 29-year-old told BBC Sussex: "I have been feeling better in training lately, but then games are a completely different story. "I'm trying and doing extra sessions to get back fitter. It is important to get minutes to be sharp again." The Spaniard suffered a cartilage problem on the opening day of the season and opted to have surgery on the injury in September. "It has been really frustrating. I tried to avoid an operation, but I couldn't so I lost a bit of time and to pick up fitness again is hard. "I feel a bit rusty at the moment and still need to work on my fitness. It will take a little bit, but eventually I will be there. If the manager [Oscar Garcia] gives me some minutes it will benefit me." In Orlandi's absence, the Seagulls embarked on a six-match unbeaten run and have climbed to ninth in the Championship table, just two points outside the play-off places. The former Swansea man believes their fixtures this month, which include facing league leaders Leicester, could define their season. "When January comes you have to be around that area to see if you are going to push for a play-off place," he added. "It is a really busy period in December and over Christmas and you need to cement your place and send a message to the rest of the league that you want to be there. "I think we have everything to push for the play-offs and even higher. We have got players coming back [from injury] and there will be tough competition in the squad, which will be healthy for the team."